Dalkhu was formed in Slovenia during 2003 by J.G. who was soon joined by Kalki on drums and together they recorded a demo entitled “Ars Goetia” in 2006. Following a few line-up changes Jurij and Berstuk joined the band, performing bass and vocals with Dalkhu releasing their debut album, “Imperator” in October 2010. When Berstuk left in 2012 he was replaced by P.Z. and Dalkhu started working on new tracks for a second album with a new intended direction. Their aim was a more powerful and darker atmosphere whilst adopting a more direct approach to death/black metal. Despite further personnel changes when Kalki and Jurij left in 2014 the album progressed and Dalkhu entered the studio at the end of August 2014 to record their new album, “Descend... into Nothingness.” The final line-up for the recording of the album was J.G. (guitars and bass) P.Z. (vocals) and Spawn of the Void who performed session drums in the studio, so essentially the music recorded here is the end result of two very talented individuals, of which J.G. is the main composer/writer. The album was recorded at Nightside Studio with J.G. mixing the album and then mastered at Necromorbus studio by the extremely prolific Tore Stjerna who has performed in several bands including Necromorbus, Funeral Mist and Into Desolation. The albums artwork is the stunning creation of Italian artist Paolo Girardi whose extensive portfolio includes work for Inquisition, Manilla Road and Diocletian. 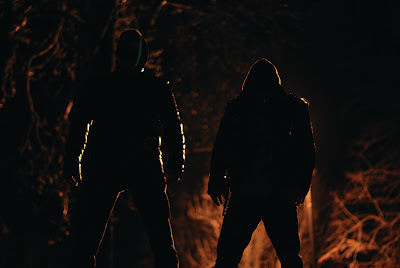 Dalkhu’s music features both black and death metal elements with opener “Pitch Black Cave” succinctly illustrating this by commencing with its feet well and truly planted in the realms of Death Metal but as the track progresses the black metal and associated tremolo influences kick in. Dalkhu usually tend to keep fairly finite boundaries between influences with both styles being quite distinct, as opposed to blended, which is more common in recent times. I don’t have a problem whatsoever with blackened death metal but it’s interesting and refreshing to see a band have two fairly separate styles at play during an album. A lot of Dalkhu’s death metal sound can be attributed to their new vocalist who delivers a steady, guttural death metal style throughout the duration of the album which is in contrast to the vocals on previous releases which concentrated more on a Black Metal style. This death metal sound is also driven at times by the guitar which also occasionally adopts a distinct death metal, riff-heavy feel, especially during tracks such as track five, “Accepting the Buried Signs.” At other times the guitar style creates quite an epic feel, such as during track three “In the Woods” which starts at a slower pace with some excellent clean guitar work creating the epic atmosphere before descending into much heavier territory. Track four, “Distant Cry” starts with an almost folk style feel to it, further illustrating Dalkhu’s willingness to explore diverse variations in sound. Also, pay attention to the opening riff as it returns during the ambitious ten minute album closer “E.N.N.F.” which is another inspiring piece of song writing that features little snippets of the many styles and variations you’ve heard during the album. Whether your preference in taste is black or death metal it will be met, and more, during this varied and ambitious piece of music. As stated, it’s not that Dalkhu have blurred the lines between Death and Black Metal as the two distinct styles, amongst many others, are audible during the albums duration. The Black Metal element is certainly more central in the latter half and what Dalkhu has achieved is a rich and varied tapestry of visionary and skilful song writing, woven together with threads of both black and death metal. This is an extremely accomplished sound that will satisfy those looking for a bit of variation in both dynamics and style. Dalkhu's - Descend...Into Nothingness is currently available from Iron Bonehead Productions, Satanath / Darzamadicus Records, with the limited cassette due in the Autumn from Godz of War / Third Eye Temple.